With Christmas fast approaching, will your kids be making any personal New Year’s Resolutions or big decisions about their future? If job hunting is top of their list, they may have a tough challenge ahead of them, something writer Emma Steer knows a lot about. Despite being armed with a degree, skills and enthusiasm, Emma soon realised that inaccessibility was the biggest obstacle to getting the job she wanted. However, there is light at the end of the tunnel. Here, Emma shares her job-hunting journey and urges young people to be persistent and hold out for what they want. Job hunting is never pleasant. Even with modern day technology removing the need to visit employers just to apply, setting up profiles on every job website takes up as much time, as does typing out your CV over and over again. Then there is the constant onslaught of emails and phone calls from recruiters to contend with. After the seemingly endless streams of rejected applications and interviews, even the most confident people begin to feel like a commodity to be passed from pillar to post until someone finds a use for you. It therefore goes without saying that disability only adds to these difficulties. As a wheelchair user, certain jobs simply wouldn’t work for me. I couldn’t stock shelves in a supermarket, and contrary to the depiction of R2-D2 as a drinks cabinet in Return of the Jedi, I wouldn’t be a good bartender either. So, I was limited to jobs that could be performed sitting down such as computer-based work and administration. That still left me a lot of jobs I could perform from my wheelchair. The next factor for me to consider was the commute. Trains are notorious for their inability to provide ramps for wheelchair users, even when assistance has been booked well in advance. Given that many train stations request that you arrive half an hour before your train is due to depart, and will refuse to provide any support at other times should a train be cancelled or missed, I simply couldn’t rely on trains to get me to and from work. Taxi companies also refuse to guarantee a wheelchair taxi at a set time due to high demand for them, so were best avoided. Thankfully the accessibility of buses has greatly improved over the past few years, so travelling around the local area was a viable option. After this I had to deal with the biggest hindrance to job hunting; inaccessibility. I applied for many office jobs in the local area only to be told that they weren’t accessible. They were always apologetic but failed to grasp that they were one of many telling me the same, leaving me with an increasingly shrinking pool of employees to choose from. What I found particularly disappointing was that recruiters were rarely able to tell me whether an employer was accessible to begin with, and were completely unprepared to address any concerns I had in this matter. Due to all of the above, I didn’t specify factors such as whether the work was temporary or permanent, salaried or paid by the hour, and how much I would earn. I applied for roles in fields I knew almost nothing about including pensions and re-mortgaging. I managed to land ten interviews in the space of a month, most of them following the current trend of competency based questions, where you are asked to describe a scenario and how you dealt with it in previous employment. Here I had even more difficulty as I only had seven months employment to my name due to being made redundant, and my lack of experience in comparison to other candidates showed. Even when I explained that this lack of experience derived from my inability to take on extra-curricular activities while studying at university due to my disability, many employers were unwilling to take the risk of employing an inexperienced candidate, which in terms of business sense is perfectly forgivable. After my ninth rejection following an interview I was feeling extremely depressed. Getting out of bed in the morning seemed pointless, I had no enthusiasm for anything, and sometimes I would even forget to eat and drink. I felt worthless and was beginning to wonder why I didn’t just accept that no one wanted me on their team, like the kid who always got picked last in sports class. One of the jobs I had applied for was a long shot, and I knew it. I had already been rejected for the role at a lower pay grade, but decided to swallow my pride and appear before the same department to interview for a different role. The role was something I had proved talented at during my degree, and I would enjoy it too. They called earlier than anticipated which I took to mean bad news, but to my surprise I had obtained the role. It seemed that my passion and knowledge of the subject matter had outshone my lack of experience, and apparently I had a nice personality too. I start next month. I know that different disabilities raise different challenges, but I can relate to the general struggles experienced by all disabled people searching for employment that make a rough time even worse. I know what it’s like to want to give up entirely. You will be sick of hearing this, I’m sure, but persistence is key. It may also be worth applying for that role you think you have no chance of obtaining, because simply having the audacity to apply shows a level of determination other candidates will lack. Surround yourself with supportive people (even online friends), sign up to as many job websites as possible, and spam employers until someone notices you. Disability doesn’t mean we can’t be valuable employees and members of society. 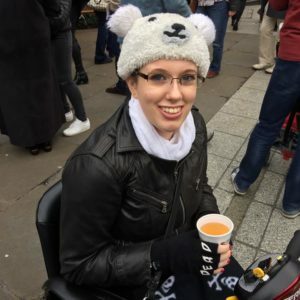 You can find more of Emma’s writing over on her blog, where she writes about anything and everything relating to disability, both good and bad. You can also find her on Facebook and Twitter. I am a wheelchair user and I would have liked to go out to work for the social aspect of it and a sense of purpose. But I think the logistics of it would make it tricky. I would have to take my carer with me and they would have to sit in the office all day too. Plus I would have to get up really early to make a 9 AM start. Working from home is a good alternative I think. I am trying to be a freelance writer.